…is my krautrock band name. Seriously, while driving to NYC last weekend, I finally started listening to Annalee Newitz and Charlie Jane Anders’ podcast, Our Opinions Are Correct – specifically, ep. 18: Alien Minds. It was so good that I listened a second time on my way home; strongest possible recommendation. The episode addresses alien minds in 3 big chunks: alien aliens (little green men/BEMs), AI/created minds and aliens that live on the planet with us. The outer space alien portion focused partly on communication (my sweet spot) – it caused me to add Octavia Butler’s Xenogenesis series to my TBR list and made me think about a couple of my favorite aliens. The Ariekei/Hosts of China Miéville’s Embassytown speak with two mouths driven by one mind and their “Language does not allow for lying or even speculation, the Language reflects both their state of mind and reality as they perceive it”. * There are a bunch of interesting things going on: language/mind feedback, the destabilizing effect of new ‘technology’ and, for me especially, the Fall (of Babel/from a state of language perfection) as the Hosts learn to lie. The other aliens that sprang to mind were the Wang Carpets from Greg Egan’s Diaspora. I honestly don’t remember whether communication ever got established with the Carpets, but they were a great stab at building an intelligence that was barely recognizable. [A] voyaging ship has found the first example [of alien life] on planet Orpheus, large “carpets” submerged and slowly moving through an ocean. The carpets hardly seem candidates for sentient life, each one being comprised of a single long carbohydrate molecule. But it turns out they are behaving as a Turing Machine made up of Wang tiles (renamed Wang’s Carpets by the human clones who discovered them). Wang tiles are a mathematical system proposed by Hao Wang in the form of a conjecture that [simplified version:] square tiles with differently coloured sides can fill an plane, and if so in a periodic pattern. Hao Wang argued that if the such a tiling exists that would imply that there is also an algorithm that would decide if such a pattern exists. Wang’s student showed that there is no such algorithm and the tiling problem is undecidable. The AI minds portion was excellent as well – encoded biases/non-neurotypical AI minds/&c, but I’m going to just tell you to listen. I’m going on longer than I wanted and am going to cut to the chase; the portion where Newitz and Anders talk to Lisa Margonelli about her book, Underbug: An Obsessive Tale of Termites and Technology. Most of my exposure to eusocial insects is via the Hymenoptera as a beekeeper and as a lover of both Uncle Milton and Six legs Better. Termites are different critters entirely. They’re most closely related to cockaroaches and rely on their gut biota to digest cellulose. A superorganism with symbiotic protists, which in turn have bacterial ectosymbiotes? Hell yes. What really got me going was the discussion (35:27) of what I am assuming (bought the book, haven’t cracked it yet) are Macrotermes colonies. 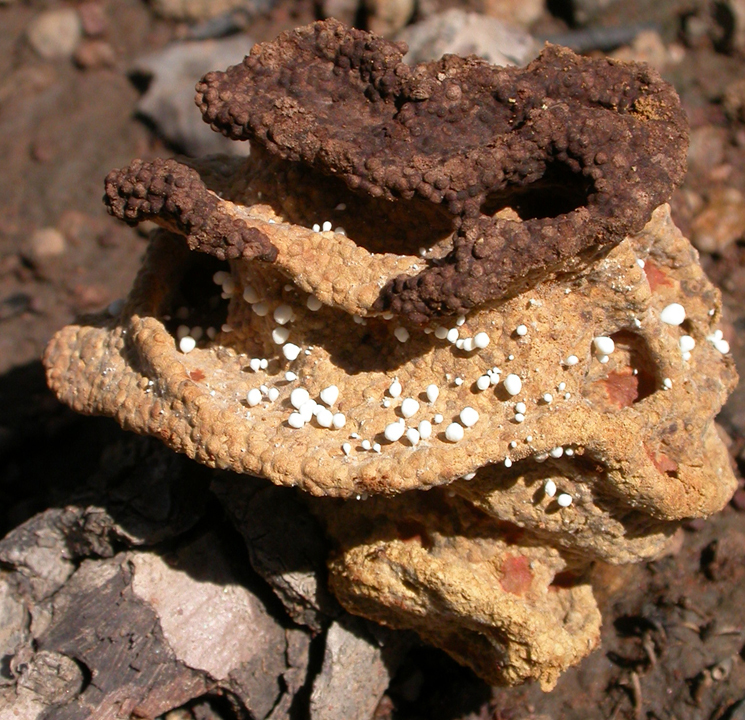 Macrotermes colonies host a remarkable symbiotic relationship with a basidiomycete fungus, Termitomyces. The termites cultivate the fungi in a fungus garden, comprising a few hundred fungus combs, structures built from chewed up grass and wood, and inoculated with fungal spores. 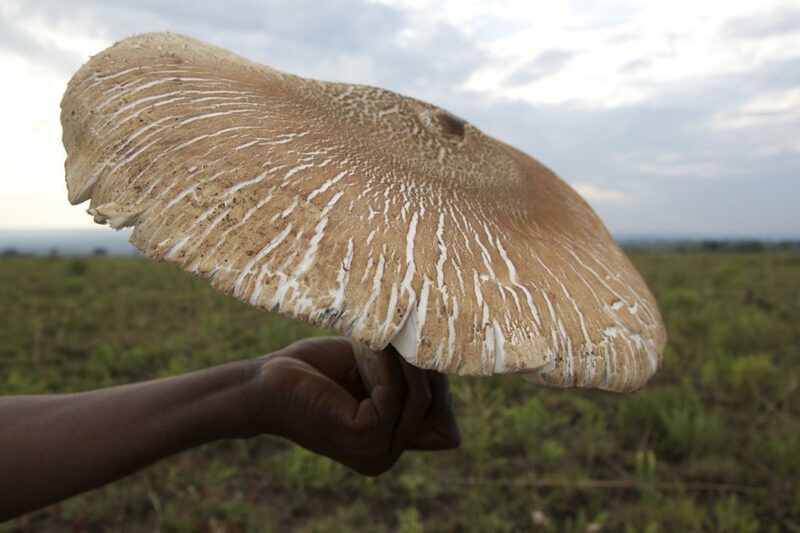 Each year, these fungi produce a crop of large mushrooms (pictured at left), known locally as omajowa, which are highly prized as a delicacy. An aside – I inoculated some logs last spring with shiitake and oyster mushroom spawn and it occurred to me at the time that what I was doing was turning wood into food with a fungal assist. I’m unclear as to whether Macrotermes have the same gut biota as other termites (wait!! see below) – guess I need to read Underbug. Regardless, what a superorganism! What a community! Extra bonus – one of the species of fungus, Termitomyces titanicus, “has a cap that may reach 1 metre (3 ft) in diameter on a stipe up to 22 inches (57 cm) in length and is reputed to be the largest edible mushroom in the world.”* Termite-stuffed mushroom caps anyone (totally serious)? P.S. It occured to me as I was proofreading that perhaps I could do a google search on ‘macrotermes gut biota’ and yes, there are papers! This entry was posted in creatures, language, scifi by John P. Bookmark the permalink.